I'm a google reader follower since... almost the beginning of your blog, I think. I never miss one of your entries. Congratulations Cristina! Please email me your shipping details and I will forward your information to Benedetta. As the blog grows, I am scheduling even more giveaways to thank you readers so there will be many more opportunities in the future. This week I have been featured on The Displaced Nation in a comprehensive interview where I give my thoughts on fashion, tea time and being married to an Englishman! To see the interview, click here. Who does not aspire to be well put together every day? In our hectic lives, we rush around all day, whether with our children, commuting to/from work, grocery shopping, housework and all the other numerous daily tasks. Wouldn’t it be great if we could have foolproof ways to put outfits together speedily to ensure that we always look fabulous, no matter what our schedule? French women have a reputation of always looking well put together. Our secret is that we follow easy rules that govern our daily decisions of what to wear and how to wear it. Two of these tips are Keep it Simple and Less is More. Please read on for easy advice that will transform your looks. Go for simple styles of clothing, whether coats, dresses, sweaters or tops. Simple lines and cuts are easy to wear and suit everybody and every shape. Flounces, frills and fussy designs are always more difficult to wear than a simply cut outfit. Simples shapes are easier to coordinate with other items from your wardrobe. Classic designs are timeless like short jackets, trench coats, pencil skirts and shift dresses. Keep these in your wardrobe and you will always look chic. The less colours you wear together the more chic and elegant you will look. The trick here is to choose one main item to wear, then to add to it with either matching or opposite colours. Try to stick to no more than three colours altogether, including accessories. This makes the look harmonious and easy on the eye. Base your wardrobe on basic colours, namely navy, black, camel, red and cream/white as you can easily add other colours to these. The monochrome look of black/white is timeless and oh so chic. You can also try other winning two-colour combinations such as navy/red, camel/navy, black/red but also pink/grey, purple/green and pink/blue. Add white or cream to any two-colour combinations to create more looks. This makes your clothes work harder for you, as they coordinate with many other items. If wearing one patterned item, keep the rest of your clothes and accessories plain, so that they do not clash. Pick one or two colours from the pattern for your shoes and other accessories to finish the look. For day looks, the simpler the hairstyle the better. Either leave you hair loose and natural, but neatly coiffed, or put it up in a neat bun or ponytail. Try not to overdo it with hair straighteners/curlers or other elaborate hairstyles, as it will eat into your time. Keep it simple but neat. In our busy lifestyle, our nails go through tough times, whether at work or at home. We find it difficult enough to maintain our nails clean and neat, without adding rhinestones or other fussy decoration. A simple French manicure or clear varnish will suffice for the day look. Keeping the length of your nails fairly short will not interfere with your work, whatever it is. By keeping colours and the look as natural as you can, you are more likely to be noticed for your own beauty, rather than your makeup. The less foundation and makeup we have on our faces, the more our skin can breathe. The look that seems to suit every woman is the timeless no-makeup look, achieved with clever use of makeup. Our beloved Coco Chanel preferred to keep her look simple and even ventured that we should remove one accessory or piece of jewelry before stepping out. This ensures that we do not look overdone. If you wear too many pieces at once, not any one piece is making an impact as there is too much to look at. For maximum effect, choose one of your favorite bold pieces and wear with confidence. I thank you for reading my article and would love to hear from you, whether for advice or comments. Jennifer's book, Lessons from Madame Chic: The Top 20 Things I Learned While Living in Paris, is now available in Paperback, Kindle and Nook. Once this baby comes I don't anticipate having a lot of time to blow dry my hair so I decided to get rid of some length and go with an effortless, yet chic hairstyle. Thank you to Valentino at Salon Nesou for your beautiful work! Speaking of babies, I am well into my third trimester of pregnancy and even though my baby isn't due until the end of May, my doctor has advised me to take it easy. I am trying to do so but as all women know, that is easier said than done! But I wanted to take this opportunity to thank all of you who have sent me well wishes about the baby.... I really appreciate it. In the meantime we are getting everything prepared chez moi in case we have an early arrival! So as I have been trying my best to take it easy, this week's post shares with you some great reading for the week. Along with being featured in The New York Times last week I was also featured on The Daily Mail in the UK and today in France's Le Point (talk about a great week!) To see the articles click on the embedded links. If you haven't already entered last week's giveaway for the Benedetta eye cream, there is still time. I am announcing the winner on Thursday. As a side note, some of you email subscribers have told me you are unable to leave comments on the giveaway post. Never fear, I am still counting your emails as entries. Good luck! This week I would love to know... what is your current hairstyle? Before this week's special giveaway begins, I am so excited to announce that Lessons from Madame Chic received a glowing review in the New York Times! As you can imagine, I'm really thrilled (and in shock). You can see the article by clicking here. Also, I want to thank you for joining me on Blog Talk Radio this morning. I had so much fun chatting with Charlotte Howard and all of you! Thanks again for tuning in. For those of you that missed the broadcast, I will have it posted on The Daily Connoisseur soon. Do you remember my video from a while back on My Favorite Deodorant by Benedetta? Well the owner of Benedetta, the lovely Julia Faller, contacted me recently to thank me for my video and to discuss her wonderful products. She has graciously offered to giveaway one of their bestselling and most coveted products, "The" Eye Crème, to one lucky reader of The Daily Connoisseur! 1. One thing that you find beautiful about yourself. (This exercise is a compliment to Monday's video Receive Compliments Graciously. It's a good self- esteem booster). 2. How you follow The Daily Connoisseur (Blogger, Google reader, Email subscriber, Twitter, YouTube subscriber, Kindle subscriber, etc.) Please note, you must be a follower of The Daily Connoisseur to enter. 3. Also, unless you have a unique online handle, please leave your first and last name (or last initial) to avoid any confusion when I announce the winner. Below are all of the wonderful details about Benedetta's eye cream. I will announce the winner one week from today... Good luck! 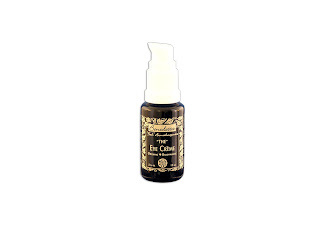 "The" Eye Crème helps diminish dark circles, puffiness and wrinkles. This bioavailable, fully organic, plant based preparation has a 100% botanical delivery system the body recognizes; transforming dull lifeless skin around the eyes, as it assists your body's defense against aging. Benedetta make their own extracts using certified organic green tea (tonifying) and amalaki (bioavailable vitamin c) made to cure for two months in certified biodymanic grape alcohol. Seabuckthorn and rosehips are added for their antioxidant efficacy, noted in the eye creme's rich orangy color. 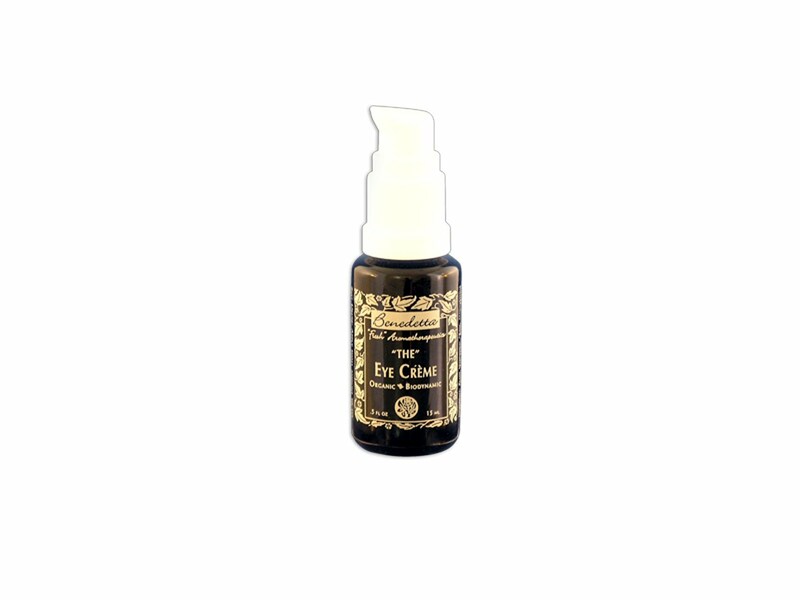 The certified organic and biodynamic essential oils in this formula are specifically chosen for their ability to regenerate the skin while moving the blood and removing stagnation. All joined authentically together in more certified organic and biodynamic ingredients to deliver results that are corrective, prevantative and continued. A little goes a long way as the botanicals in this formula absorb into the skin easily and effortlessly. This bioavailable preparation may also impart a cool feeling around the eyes, a sign of the active ingredients doing their job. Best usage: after cleansing with Rosemary & Geranium Creme Cleanser, apply 1/2 pump of "The" Eye Crème to middle and index fingers and pat around boney ridge of eyes from inside corner above eyes to inside corner below eyes. Use daily as a preventative. Before this week's post begins, I have a special announcement. This Thursday, March 22nd, I will be live with the fabulous Charlotte Howard from The Hair Artist Association on Blog Talk Radio! The show begins at 8am Pacific Standard time (11am Eastern). We will be discussing The Daily Connoisseur, Lessons from Madame Chic and my writing process. I look forward to speaking with you live! Two great beauty finds have come across my desk recently and I wanted to share them with you. When I did my last makeup post and video a lot of you with mature or dry skin stated the wish for makeup that is not too matte and provides a glow of sorts to the skin. I took note and when Manna Cosmetics offered to send me samples of their Sheer Glo Luminizer I thought I’d give it a try. Manna Cosmetics describes Sheer Glo as an incandescent liquid that lights up the skin with all over radiance. All you need is a tiny amount, either mixed with your foundation or worn alone on the skin, and you have an instant dewy glow. I like this because it isn’t too over the top and sparkly. Its luminescence is very subtle. It can be used on your face and your body and would be particularly nice on the neck and décolleté for spring. So for all ladies with mature or very dry skin, or who are simply in need of luminizing this is an excellent radiance booster! A few years back (before I had my baby) I got eyelash extensions. I loved the look of eyelash extensions (I got the really natural looking ones) but didn’t like all of the maintenance and expense that went along with them. To get them applied took nearly 3 hours the first time around (!) and regular salon visits, every two weeks were mandatory so as to not look unkempt. If my schedule ever permits in the future, I might consider getting them again (I’m talking waaay down the line, I don’t see having the time to keep them up anytime soon). But until then, for special events, or for days when I want to feel extra glamorous, there are always false lashes. Lashfully is a company based in San Francisco, California that has eyelash extension salons in San Francisco, Walnut Creek and West Hollywood. They launched a new at home kit called the Lash Appeal Kit for those of us who aren’t able to get extensions. The company sent me the Lash Appeal Kit to try out. Now I have to tell you that I am terrible at applying false lashes. I’ve tried so many times (usually the strips found at the drug store) and end up looking... not so amazing. I just seem to be so clumsy with the delicate little things so I was interested to see how a complete novice like myself would fare with this kit. The kit includes: a full set of individual eyelash clusters in 10 mm and a full set in 12 mm (for real drama). It also includes a flathead tweezer and temporary eyelash adhesive along with comprehensive instructions. The first time I applied the lashes, I'm not going to lie, it was a bit of a disaster. They managed to look good in the end but I made a few mistakes along the way- namely using too much glue. You only need the tiniest amount of glue on the end of the eyelash cluster. It’s also important to allow the glue to set for 10 – 15 seconds before applying the eyelash to allow it to get tacky. For eyelash novices like me the key here is to practice. With every application, you get better at it (and thankfully each kit provides enough lashes for several applications). Once you get the hang of it, the lashes go on smoothly, right on top of your natural lashes. Lashfully says if the lashes are properly applied, they can last up to 5 days! I only ever got mine to last one day because when I removed my eye makeup at the end of the day, the lashes would inevitably fall off. So perhaps if you go for the no makeup look and do not wear eye makeup (after all, you might not need it with your enhanced eyelashes) the lashes will last longer. If you do want them to last more than one day, Lashfully suggest you apply the lashes on clean eyelids that do not have moisturizer on them. Also, they suggest you do not wet the eyelashes for the first 24 hours after application. The second time I wore the lashes I took a long walk, I kid you not, in a wind storm (hence my messy hair in the above picture!) I was certain that when I got back home half of my lashes would be gone but they all remained intact. If you only plan on wearing them for one day- or to an evening event, I would recommend applying your eye makeup first, then putting on the lashes. This way you will not disrupt the lashes when carefully applying your eyeshadow and eyeliner. Thank you to Lashfully and Manna Cosmetics for allowing me to try your products and share my finds! Until then I would love to know... What are your thoughts on luminizers and lashes? And do you receive compliments graciously? I wanted to take this opportunity to say Thank You to all of you for your comments and emails regarding Monday's post On Rejection. So many of you shared your own stories and struggles. It has truly inspired me. I'm really grateful we have this community together where we can support each other in achieving our goals- so thank you again! And to make sure you never miss a video (if I don't post it on the blog) be sure to subscribe to my YouTube Channel. Cindy La Ferle references Lessons from Madame Chic in her article titled Useful and Beautiful. Elizabeth Lukes has written about Lessons from Madame Chic on her new blog, The Strength of Words, in an article called, The French, Demystified. And lastly, writer Annie Brewer has written a marvelous review of Lessons from Madame Chic on the Yahoo! Contributor Network. Until next time, I would love to know... what is your favorite neutral nail polish? This is both a personal and professional anecdote today, but it is meant to inspire you to never give up on your dreams and to never let someone else claim your power. Ever since I was a child I always dreamed of being a writer. It was my first interest. I got sidetracked along the way with dalliances in theatre and film (which were actually quite enjoyable) but ultimately I knew I wanted to write books one day. So when I decided to get serious about it and took a writing class in my late twenties, I fell in love with writing. It felt natural, it felt fulfilling and it felt like something I was meant to do. The creative process was so magical. I wrote two books (Lessons from Madame Chic and my mystery that will be out later this fall) and it was time to share them with the world. Only thing was, I needed representation. I needed an agent. I needed a publisher. 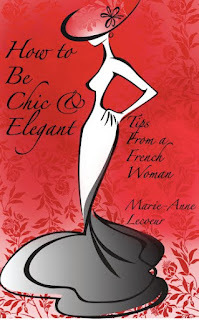 So I started to submit Lessons from Madame Chic to literary agents. I submitted to a lot of literary agents. Many of them showed interest and even strung me along for quite some time, asking to read the proposal, wanting more chapters, etc. But ultimately they all rejected the book for one reason or another. Most of them said they didn’t think I would have an audience for the book. That it had been done before. In my heart I knew this wasn’t true, but the rejection still hurt. I heard that this was typical. That in this day it is very hard to get representation unless you are a celebrity or a reality TV star. Each rejection felt like a slight punch in the belly and I went through a momentary dark phase where I thought that perhaps my dreams had come to an end. Then I realized I was placing my power in the hands of other people. Why should I let other people determine my fate in becoming a published author? This was my life after all! I decided to take control. I self published my first book, Lessons from Madame Chic: The Top 20 Things I Learned While Living in Paris, in the fall of 2011. Since being published, the book has been featured on CNN, BBC, 35 newspapers across North America and has received so much support from the readers that identify with it. It has remained on the Amazon bestseller lists in three categories in both America and the UK since its debut and hasn’t budged yet. But most readers are able to look past the imperfections and embrace the true heart of what the book longs to convey- that a life lived passionately is all that matters. That being chic isn’t only about style and the tangible aspects of living, but the intangible as well. That it doesn’t matter what you do, but how you do it. If you are ever faced with rejection in your life (whether romantic, professional or creative) it’s OK to feel that initial bruise. Go ahead, you can even cry (I did!) But never let anyone else hold the power to your life. If you believe you can do something, then you can do it. And if you have drive, a positive attitude and come from a place of love, you will succeed. I would love to know… what is your experience with rejection? And how has it shaped you? **Update: Lessons from Madame Chic has been acquired by Simon & Schuster and will be re-released in the Fall of 2012! I tend to like these sort of posts where people share seemingly mundane aspects about their domestic life: what's in my handbag, what's in my fridge, etc. I like to see what people buy at the grocery store, for example. Call me strange but these intimate details intrigue me. I am constantly rotating the beauty products in my shower, mainly because the skin and hair can get complacent if the same beauty products are always used. And also because I am somewhat of a beauty connoisseur too and adore finding new and exciting products. RenPure Organix Moisturizing Shampoo This was a drugstore purchase. It's a nice little line and moisturizes my hair well. Aubrey Organic Honeysuckle Rose Shampoo Purchased at Whole Foods, it's the sort of shampoo you feel good about using. No parabens or nasty stuff. Kérastase Bain Apres Soleil A definite splurge but takes care of sun damaged hair beautifully. This was purchased at the beauty supply store. Klorane Mango Butter conditioner I love this conditioner and the brand Klorane. I purchased this from Soap.com where I get a lot of my household supplies (PS if you live in America and have not yet discovered the wonder that is Diapers.com, Soap.com, etc. check them out. Free 2 day shipping. It's amazing. I get everything delivered now and don't have to schlep to Target anymore). Sibu Beauty Sea Buckthorn Cleanser Yes, I still use Sibu and love it. I go between using this and the Paula's Choice cleanser at the moment. Visit Sibubeauty.com for more information. French milled soap in the scent Miel (honey) purchased from the beauty supply store. Also, Lessons from Madame Chic was recently mentioned on two lovely blogs: Classic + Glam blog, in a post about The Classic Lady and on the lovely Rebekah's Cupcake Caramel. So this week I would love to know... what's in your shower?